In his bestselling book, Last Child in the Woods, Richard Louv coins the term “nature deficit disorder” and encourages parents and educators to help kids reconnect to the wonder of nature. Stress reduction, greater physical health, a deeper sense of spirit, more creativity, a sense of play, even a safer life — these are the rewards that await a family when it invites more nature into children’s lives. ​As adults and educators, we know the benefits of such engagement. Nature calms and refreshes. It heals and centers. A walk in the woods, a starry sky, a quiet morning by the lake, a bird at the feeder — nature’s countless moments engage the senses and fill us with wonder. In a word, nature inspires. Nature Journaling and Poetry are two powerful ways people of all ages can explore and express that experience. 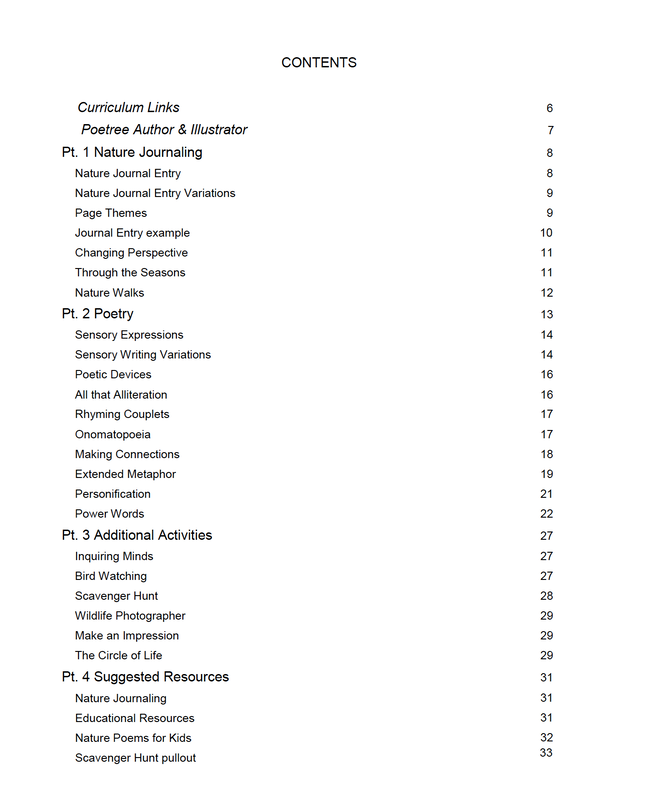 In this free Poetree Activity Guide will find resources for Nature Journalling, Poetry, Art, and additional resources including other nature poems and a scavenger hunt.